Have a bad local drone law? Our “Drone Letter” service is designed to prompt a change to your local government’s ordinance without filing a federal lawsuit. However, we stand ready to challenge ordinances in court. For a flat fee of $250 we send a federal drone law educational letter from Antonelli Law Ltd to the local governmental entity contact you provide. This service is referred to as our “Drone Letter” and it is a great first step in trying to avoid having to file a federal lawsuit against your local government. Contact us by clicking this link to hire us to help your local government become better informed. When combined with community support, we believe a federal drone law educational letter from Antonelli Law can provide the resources and impetus for a local city or town to avoid what happened in federal court to the City of Newton, Massachusetts. Background on the problem of bad local drone laws, and the “Ounce of Prevention” we advocate for called express federal preemption. Antonelli Law has been beating the drum for over a year now: We absolutely must get Congress to add clear “federal jurisdiction only” provisions in the 2017 FAA Reauthorization Act. Language that says explicitly only the FAA has jurisdiction over the national airspace and drone operations, not any local town or city. This is the “ounce of prevention”. If Congress does this, it will make a lot of “stupid drone laws” passed by countless local governments across the country go away, like this one in Chicago. If you did not already read about it on sUAS News, we defended a Part 107 pilot that was prosecuted by the City of Chicago for a local drone ordinance. We won the case, but the point is that many local drone ordinances are way out of line in our opinion. Including Chicago’s. We also see reports that some industry players like Airmap are advocating for just the opposite, for local law enforcement in the first 200 feet AGL. According to these reports, Airmap supports the Drone Federalism Bill introduced by Senator Dianne Feinstein. What if Express Federal Preemption Does Not Make It Into FAA Reauthorization? But what if Congress doesn’t add clear “federal jurisdiction only” provisions to the FAA Reauthorization Act this year? What if, for example, they kick the can down the road again and pass an extension FAA bill like they did last year? UPDATE: That’s exactly what happened. If this happens, it will be up to drone – UAS pilots and companies to challenge each local “drone law” passed by their local governmental entity when it runs afoul of federal law. And even this path will only be available as long as Congress does not pass Senator Feinstein’s Drone Federalism Bill (or one similar) which would give low altitude airspace jurisdiction to local governments instead of the FAA. The “grade A” thing to do is to file a federal lawsuit, like Dr. Michael Singer did against the City of Newton, in the district court which the local governmental entity sits, asking the federal court to strike down all or part of the local “drone law”. Antonelli Law can file a federal lawsuit in any federal district court – anywhere in the United States and we welcome the opportunity to do so. But this is a serious undertaking, requiring a great deal of money, as well as time. Most hobbyists and drone pilots will not be able to afford to do this. So, I came up with an idea. After seeing yet another “stupid drone law” passed by some local government unit posted on Facebook, I thought: What if someone seeing this happen in their community could have a letter sent from Antonelli Law’s Drone – UAS Practice Group explaining what the federal law is, and what in our opinion a local governmental entity can and cannot do without running afoul of federal law? After all, Antonelli Law helped pioneer Section 333 approvals in 2014 when they were hard to do, and we helped several clients obtain Part 107 night waivers the very first day the FAA allowed them. We know something about the UAS industry and “drone law”. if a local government or their attorney looks us up, they will know we’ve been in “this thing of ours” for a while now and have real knowledge – as well as demonstrated litigation capacity. In other words, an educational letter. One also enclosing the FAA’s UAS Fact Sheet explaining the FAA’s position on a local governmental entity can and cannot do without running afoul of federal law? After all, the issues of drones flying around is still new to most local towns and cities that they probably just don’t know any better. Maybe, they can be taught; or at least encouraged to read the law and do things the right way. After floating the idea on a Facebook group with a very active and intelligent user base, I decided to start offering this service called the “Drone Letter” program. At $250, it is the smallest legal fee we’ve ever charged in our 10 year history. If it works for you, you helped make a change in your community. And in the aggregate, just maybe this Lilliputian effort might be one more way the industry tackles this problem across the country. Once we have spoken with you and accepted you as a client, you will sign our engagement agreement and pay the online fee. One federal drone law educational letter will be sent from Antonelli Law Ltd to the local governmental entity contact you provide. This is referred to as our “Drone Letter”. You will be identified in the “Drone Letter” as the person who requested we send our “Drone Letter”. We will not send a “Drone Letter” without doing so. Included in the mailing will be one copy of the FAA UAS Fact Sheet of 2015 which explains the FAA’s legal position of what may, and what may not, be legislated by local governmental entities without running afoul of federal law. If we are contacted by that local governmental entity or their legal counsel, we will briefly explain to them the educational purpose of our letter written on your behalf. You may contact us once by telephone or email for up to 15 minutes of our time to discuss what response there was by the local governmental entity, or what further action you and we might be able to do. We hope this will help turn things around for a lot of local areas. Our hope is that by providing legal educational information to them the local governmental entity will take steps to be in compliance with federal law, and act in a positive way with regard to its citizenry and to the UAS community. In the City of Newton case a Massachusetts federal court found that three drone operational restrictions in the City of Newton, Massachusetts municipal ordinance were preempted by federal law: And in the case of Orchard Park, NY, due to superb droner activism including Mr. Keith Kmieciak and Mr. Michael Wooten of WGRZ the town decided to rescind its drone ordinance and will likely dismiss the ticket issued against Joe Danno. Our Drone Letters now include the City of Newton case to put local governments on notice that if they fail to recognize when their ordinance is preempted by federal law, they may lose badly in federal court. 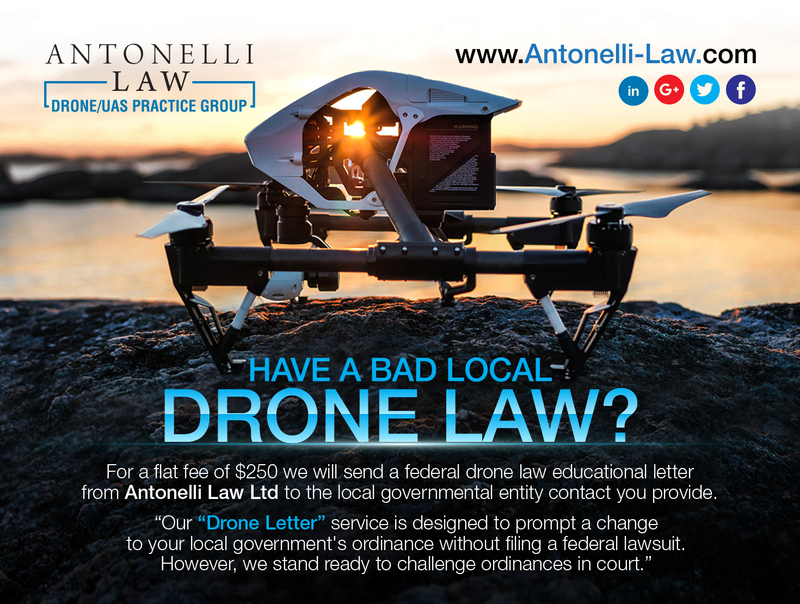 Please use our contact form here to hire Antonelli Law for our new “Drone Letter” program. Mention you would like to begin the short process of initiating a “Drone Letter” for your locality. We can offer this service nationwide because the issue is federal law. We can offer this service nationwide because the issue is federal law. Attorney Jeffrey Antonelli is admitted to numerous federal district courts around the country, and can appear in federal court anywhere in the country due to special federal rules. The “Drone Letter” service and is a great first step in trying to avoid having to file a federal lawsuit against your local government. We offer absolutely no guarantee that the outcome of our sending a letter to the local governmental entity you provided to us will be what you wish. And of course we cannot predict what their reaction will be, if any, although we hope it will be productive and positive. As one of the very first drone law practices in the country, we are passionate at being at the cutting edge of legal policy and advocacy in the drone-UAS space. The new “Drone Letter” program is only a small fraction of our services, which is subject to change or cancellation without notice. Please have us in mind for any Part 107 waiver, business, regulatory, or litigation matters you may have. To hire Antonelli Law for our new “Drone Letter” program please use our contact form here and mention you would like to begin the short process of initiating a “Drone Letter” for your locality. Then, please Call Your Congressmen to fix the 2017 FAA Reauthorization Act bill and vote NO to the Drone Federalism Act. Have a bad local drone law? Our “Drone Letter” service is designed to prompt a change to your local government’s ordinance without filing a federal lawsuit. However, we stand ready to challenge ordinances in court. For a flat fee of $250 the pioneering UAS law firm Antonelli Law will send a federal drone law educational letter to the local governmental entity contact you provide. Call us at 312-201-8310 or use the contact form.